Many of our customers have asked us if it was possible to get discount vouchers and special offers for future rentals with Malagacar.com. Thanks to your contributions and several weeks of programming plus some more of tests, we decided to activate the promo codes on our reservation system. UPDATE: All our customers can now get up to a 20% permanent discount on their bookings with MalagaCar.com’s Loyalty Program. What is a voucher/discount code? It is easy, the code or voucher is like a password that gives you access to some exclusive special offers and discounts, which otherwise you would not find on our website. How can I get voucher codes? Also we recommend you to suscribe to our blog where you can find promotional codes among the latest news and events in Malaga. Another way to get good discounts is sharing your experience with Malagacar.com in review pages such as Review Centre, Trip Advisor, Virtual Tourist, Trust Pilot, Google Places, Yelp or our customer reviews page. Just post your testimonial on any of those websites and send us the link where it appears. It is the easiest step of all; all you have to do is access our online car hire booking and enter your discount code in the ‘Code‘ field. Then choose your dates and click ‘Get Quote‘. – The code entered does not exist: Check there are no spaces or incorrect characters. – The code is not valid for the chosen date: Most of the bonuses are valid for a period of time and for rentals within certain dates (the conditions are always indicated next to the promotional code). Remember, promo codes are not cumulative with other vouchers or discounts, including the Loyalty Program. We hope you enjoy this new proposal and save even more on your next car hire at Malaga Airport. What do you think? Do not forget to comment and share with friends and family. First time too with your company (April ’19) can I get a discount please? Ive started to holiday in the Malaga area quite regularly and always hire from you. I’ve liked you on Facebook, so is that how I get a loyalty promo code please. As I did the same ‘like’ than Nicky, and I am looking forward to visiting Malaga next month, could you grant me with a coupon code ?. If yes , thanks for telling me. I was quite désappointed using service of one of your competitor few years ago and wish to deal with a serious company like yours, accordind to the reviews. Please could I have a promo code – i have used your company numerous times. Dear Peter, thank you for being our loyal client! As our return customer please book always with your client menu to benefit from your increased discount of up to 20% (1- 5 rentals: 5%. 6 rentals: 6%… 20 rentals: 20%). Then you can login into your account where will be applied automatically the discount, depending on the number of hires you have already made (Please use always the same email). The discounts are not accumulative. Please first log in into your account and then fill in the discount code HELLOFAN. The system will recognize automatically which discount is more beneficial for you and apply it. Example: If you have hired less than 10 times with us, thus it would apply the 10% of the HELLOFAN discount (for rentals up to 21 days on cars tagged with “promo”). last year June i used malagacar on the recommendation of a friend. i was skeptical because i have never hired a car in spain and worried about the excess etc. i have to say the staff and process was very easy and explained clearly to us. we got our car and returned it seamlessly and our excess was immediately refunded back to my card. no funny business at all. will definitely recommend this company as in fact i am planning to use them again this year. Hired from you in September last year. Great service and recommended you to others. Looking to hire again next Thursday any chance of a discount code? Also liked your Facebook page. Thanks for using our company! We are also a customer from 2 years ago. We had always a good car and no problems with malagacar.We would like to rent again next month April 2018. Please Can we have a code for discount? Hi Julien, please use the HELLOFAN promo code. We have also been using Malagcar the last two years. Good cars and no problems with Malagacar. We would like to rent again July 2018. Do you have a Promo code? But it’s advisable to log-in using your customer account to get better discounts. We booked last year with you guys and it is was a great experiance comparing to other agencies. Quick handling and good cars. We are looking to book with you again in July. As we are coming with friends we are going to book three cars for about 11 days with 12 people. Can you make us a good offer. Hi Nick, please use the HELLOFAN promo code and don’t forget to log-in to use your customer discount. A lot friends of us recommended the best car service – malagacar.com. We are looking forward to get deal with you and want to hire a car (Group C) for almost 3 weeks (from 14.09. till 04.10). Is it possible to get some kind of discount or promo code. Do I need to make registration or subscription to login to You system? Hi Aleksejs! You can use the HELLOFAN promo code (valid for up to 21 days). Thank You so much for your offer!!! Hi Aleksejs, I’m sorry it seems that the promo code is limited to 15 days. Hi Aleksejs, it’s working fine again for up to 21 days. We are renting there for over 8 years and will rent again like end of August. Thanks Malagacar.com for making our holiday in Malaga easy. You are welcome Farida! Please book always with your client menu to benefit from your increased discount of up to 20%. we also have a discount code if you like us in FB. I have been renting at malagacar for many years for longer periods ! THE service has always been great and always very good pricing ! But this year the prices are higher then other companies? Is there a promotion code for August ? Hello Yves & thank you for being our loyal customer! Please book always with your client menu to benefit from your increased discount of up to 20%. We have also a discount of up to 10% if you like us in Facebook. If you wish you can contact us via our FB page https://www.facebook.com/malagacar for a faster communication or via email at info@malagacar.com. Please let us know your exact hire dates and car group requirements and we will check it for you. Van I found the same problem my family and I have always booked with malagacar.com because we trusted them and their prices were always competitive until now…. but because I have only personally booked twice I only get 5% discount even though my family holidays have all had hire cars from Malaga.car.com…. Hello Andrew! Please contact us via email at info@malagacar.com with your customer details and we will be pleased to help you! Is there any discount codes for lojal customers? Hello Sandra! Thank you John for being our loyal customer! As such, please book always with your client menu to benefit from your increased discount. I am a regular customer and have been using malagacar.com for the past 6 six years, we have always been delighted with the service and value for money malaga car represent. I am looking to book 2 for a big family holiday this summer, at around the renault meganne size and spec and as usual will be taking the web rate as this has always been excellent value and suitable to our needs. Is there a discount that can be applied to 2 car bookings as someone who is a loyal customer? We have used MalagaCar several times over the last couple of years and will be using at least 3 times again this year. You are met at the airport arrivals and transported by minibus to the office, where you are processed and the car issued within about 10 minutes. Drop off at the end of the holiday is just as painless! I would definitely recommend out of all the car hire companies I have tried at Malaga. Thank you Nicky! See you soon! We have used Malagacar.com at least 3 times and have had positive experiences each time. You are picked up from the airport and 2 minutes later you are at the office. Hello Taura! Thank you for being our loyal customer! As such please book always with your client menu to benefit from your increased discount. my daughter recommended, malagacar.com to us. We had an excellent car and furthermore when we drove into the garage one of the staff noticed my husband struggling he has a knee problem and she told him to stay in the car and called a colleague to drive us to the airport. What a relief and thank you so much. You have to book them individually. Once you have booked the first car your will receive your account credentials, so you can log-in to avoid filling up again your personal details. I always book my car with you every time i go to spain, however i didnt realise you do promo codes. I have wrote a review on your page and also like your facebook page is their any chance i can get a promo code.. I plan to go out to Spain in Sept and will be making my booking? I’ll do it. Thank you ! Is this the place where I can cancel my reservation. I already made another one? If you cannot see your previous reservation, please send us your cancellation request including the old booking number to carhire@malagacar.com. Thank you. I’ve already booked a car. But today I realized for your promo code. Can I make another reservation and to cancel the other one ? Or I simply have to make another reservation and to come to you with the the new booking number ? You should make a new reservation and cancel the previous one. Thank you. Any discounts if I book now for April-May? You can use HELLOFAN promo code. Hi, we are travelling next month to Malaga and have been recommended your company. We are hoping to hire two BMW X1’s (M8). Do you have a discount code for this? You can use the HELLOFAN promo code. Hi, we have rented from you a number of years ago and are now returning to Spain in October, from 17th to 30th, we need two cars, an Astra size plus perhaps a quashkai, do you have a discount code which is valid? You can use the HELLOFAN promo code. It’s valid for the Group D2 (Astra) but doesn’t apply to Group M5 (Qashqai), maybe you can book that one without discount or get the Group M8 (BMW X1) for only 100€ more. Quickly in the office and kindly personel/staff. I always rent at MalagaCar. Have rented here several years and recommanded the firm i Denmark. Dear Kristian, thank you very much for your Feedback and for being our loyal customer! Please remember to book your cars with your client login (https://www.malagacar.com/password_help.html), in combination with the discount code HELLOFAN, for a special discount. Have rented 4 cars in october this year. And we have absolut no problems. Quickly in the Office – nice People’s. your client login (you find the customer number on your last rental agreement. Otherwise at this link https://www.malagacar.com/password_help.html you only have to fill in your date of birth and email with which you booked your last car hire). This you can use in combination with the discount code HELLOFAN for car groups tagged with “promo”. I am coming to Malaga for a family wedding arriving on April 12 around 11:30pm and departing on April 18 around 11am. I was wondering if you have any promo/discount codes for an automatic Group M7 vehicle (Nissan Quashqai). There will be other family members looking to rent as well, would love to pass their business on to you as well as I’ve heard great things about your company! Let me know if any discount codes available. THanks! C1, D2, F, DB, IA, E0, E3, G, G1, G9, M1, M2, M3, M4, P1 and P2. Could do with a promo code for an automatic with space for 5 adults and 3 suit cases! Hi Guys, we have used Malagacar for the last few years now, have left a great review/comment and a ‘like; on facebook link. Can we have a promo code as we need a larger motor this year with the full insurance. Thank you Carl for being our loyal customer! Please book your car with your client login for a special discount (if you don´t remember it, you can easily apply for it at https://www.malagacar.com/password_help.html) in combination with the discount code HELLOFAN. I used MalagaCar.com in February and was very impressed with the service and quality of the rental car. We will be returning to Malaga in April (12-18) and are looking to rent two vehicles that week. Any promotional code you have for that time period would be greatly appreciated. Thanks! Hello Shamir, thank you for the Feedback and for being our loyal customer! We have used Malagacar.com twice now, the service is fantastic, cars are great. We are looking at re using you again for this year…. 10th August to 24th August. Would you have any great promotional codes please? Hi Sarah, you can use the HELLOFAN promo code. Used you guys several times over the last few years. Delighted with vehicle and service. Looking for a car from 8/2/15 till 15/2/15. Any promo offers on. Thank you Gwen for being our loyal customer! Please book your car with your client login for a special discount (if you don´t remember it, you can easily apply for it at https://www.malagacar.com/password_help.html) in combination with the discount code HELLOFAN. I am interested in renting a car from march 27th to april 5th 2015 and heard good thinks about malaga car. I am interested in group D category and wanted to know if there is a voucher / promo code for this category. At this moment we have no promo codes for group D, but you can use HELLOFAN to get a better price on C1 or D2 (very alike). Hi, we go every year to Malaga and the past 2 years we have rented a car to you. In may, we hope to come again, it is possible to obtain a promo code? We have been going to Malaga 4-5 times a year the last three years and we have always used an other company. The service has varied a little too much. Some friends recommended Malaga Car and we rented a car from them last time. We are very pleased with both the car and the service at Malaga Car and will certainley continue renting cars there! Dear Mrs Svensson! Thank you very much for your review, we just send you a private message, kind regards! Hi Katie, you can use the HELLOFAN promo code. I’ve sent you the code via email. Hi looking for your cheapest price for 2 weeks 1-15 August 2014, with any promo code. happy with a small car, and confirmation pick-up is at airport, thanks! We use a minibus to take our customers from the airport to the rental office (it’s less than 2 minutes away from the arrivals terminal). Hi Alan, you can use the HELLOFAN promo code to get a special discount on group G9. 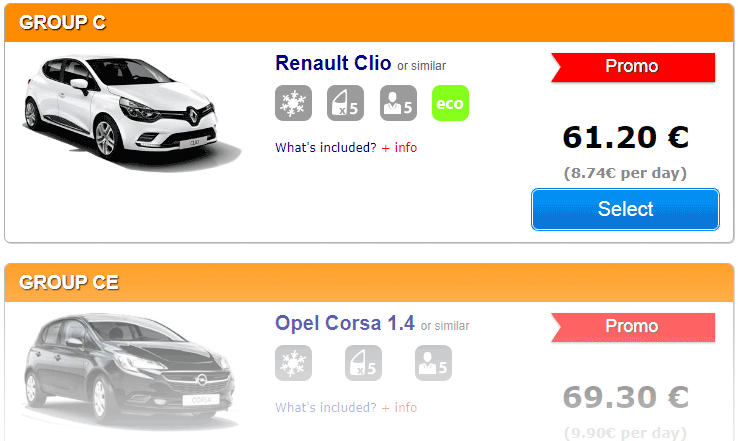 263.75 € –> FULL-PACK RATE (includes additional driver + half/half + premium insurance without excess). Hi, looking to book a car 30th July to 11th August. Is there a promo code avaialable which I can use now to book? Please use the code HELLOFAN. Bonjour, comme en mai-juin 2011 ,j’avais loué une voiture chez vous et que j’ai été très content de vos services, je reviens vers vous pour la période du 31/08 à 23:10 au 16/09/13 à 18:50 ( horaire avion ). Avez-vous des promotions? Other operators are currently showing lower prices than yours.What is your best price? Do you have any discount vouchers? Hi Paul, I’m forwarding your question to our reservations department. You will receive a reply by email soon. Im going to Malaga the 19th of April 2014 for one week. We will be traveling 12 people, and would like 2 big cars and 1 small car. Could you mail me an offer? Hi Rasmus! I’m forwarding your enquiry to our booking department. I have been looking, quite a while for a reliable and cheap, car leasing company I have searched at the web for this, and I must say that you are often mentioned. You’re known as a reliable and cheap company on the internet. Shows that many people have good experience with your company, and I must admit that you’ve interesting prices. I would therefore give it a try and I’m sure that I’ll be a part of people who have good experience with your company. We are a travelling party of 6 people, so I hope you can arrange for us a promo-code for two cars. And of course I want to post several reviews, because I want to help others to choose the right car leasing company, and that’s Malagacar.com. HI just wondered if there are any promo’s for late april. weve used Malagarcar for years and are coming back in april but ive never used a promo code so i wondered is there any for april, your on my facebook, thanks. Hi again i rented a toyota auris diesel off you in january for 10 days and cannot thank you enough for the wonderful service again , and i would also like to thank you for the car this time as it was all i could have wanted. I am looking to hire from you again from the 8th october to 22nd october this year and would like to know if you have any dsicount codes for this period. I will be booking for a family holiday on 28th March till 6th April after you were recommended by a friend of ours. Following you on twitter and happy to provide feedback on trip advisor. Will there be any discount codes available for our booking? When making your reservation on the website, please enter the Promo-Code HELLOFAN. However, this Promo-Code is valid only for some groups, for example in the date you want to rent a car, the Promo-Code is available for the groups C1, D2, F, DB, IA, E0, E3, G, G1, G9, M y P.
Later, if you are satisfied with the service received and if you would like to write a review as our customer in places like Google, Tripadvisor etc., we will provide a special discount which also includes many more groups than the “ordinary” Promo-Code. In order to obtain this special discount for future bookings, you have to send us an email including the link to the page where you published your review. We have found your comment in our blog and I must say that it was wonderful for me to find a message like yours, we always try our best to provide the best customer service and I’m glad to know that you come back to our beautiful country and rent from us again. For your next booking please use the CLIENT LOGIN which is on the left of our website that you access with your email address and the password we have sent to your email address; with this, you can make your reservations with the discount for regular customers and you don’t need to enter all your personal details each time you book online. My wife and I will be returning from a cruise, and landing at Malaga port. We will be renting a car from you on Mar 10. We will be visiting Malaga Mar 10-17, 2013. Is your office near Malaga port, or is your office near Malaga airport? Do you provide a shuttle between Malaga port and Malaga airport? Could you provide us with a “Promo code” for our car rental, please? This page is only for comments related to published Blogs. To make a reservation, please go to the http://www.malagacar.com main menu where you can enter the date and time of arrival, and the place where you pick up your car. As Promocode can use HELLOFAN. Regarding your questions, our offices are located one minute from Malaga airport. We offer a shuttle service included in the collection of the car at the airport. If you want to collect your car directly at the port of Malaga, you are charged an extra of 30 €. You can return the car at the port or the airport if afterwards you are catching a plane. If you have additional questions or concerns, please directly contact customer service at info@malagacar.com or whatsapp (+34 600 523 523). We rented a car through you last October and had such a good time in Andalucia that we’re coming back for a week next June! Are there any promo codes cars that would suit a family of 3? We are glad you enjoyed your stay in Andalucia and that you will be renting with us again. You can enter our current Promo-Code HELLOFAN when making the reservation on the website. You are interested in a Promo-Code for a car for a family of three in June. But we don´t know your requirements on neither the car nor the exact date, in order to answer accurately. Group C1 Seat Ibiza 5 doors or similar for 76.50 € / 7 days. Group D2 Opel Astra 5 doors DIESEL GUARANTEED or similar, for 93.60 € / 7 days. For your information, these are the current prices of this week and they are not fixed prices. This means, the closer the summer dates and therefore the demand for these cars, their prices will be also increasing. Therefore, if you find this offer interesting and it suits your needs, we recommend booking early, to ensure the best prices. We would like to rent a C class from August 10th to 24th 2013. We are recommended by very good guests of you : Crawshaw family. Would it be possible to get a promo-code or discount voucher please ? Many thanks for your kind assitance. Welcome and thank you! Yes, there is a Promo-Code for August. However, this Promo-Code is valid only for some groups, for example in the date you want to rent a car, the Promo-Code is available only for groups C1, D2, F, DB, IA, E0, E3, G, G1, G9, M y P.
So we suggest the following: You can apply the Promo-Code to the C1 group and get for only 8 Euros more a car in a higher category. Later, if you are satisfied with the service received and would like to write a review as our customer in places like Google, Tripadvisor etc., we will provide a special discount which also includes many more groups than the “ordinary” Promo-Code. Hi! I’m going to rent again a D-class car for 6 weeks from mid-november to end of december. As you recommended I’ve left a reviews on facebook, malagacar.com and TripAdviser. I hope to get a promo-code or a voucher to extra discont. Is it possible? If “Yes” how I can get a promo-code? I’m looking for a promocode for a d-class car from oct-nov.
You can also log-in with your user and password to get a special discount on group D.
Have you codes for 26th July to August 9th category d please? Hi, We have booked with Malagacar Hire on many occasions and were wondering if we would get discount for hiring a Volkswagon Passat Diesel for 17 nights from 14th August – 31st August 2012. Is there a discount code for April 25 until May 14 th ??? Hello, try FU2012 at malagacar.com – you should get a 10% on groups C and C1. you can also follow our Twitter, Facebook, Google + or subscribe to our newsletters for the latest discount codes. we are planning our holiday 2012 (in July) in Malaga. We are very interested in renting a car from Malagacar. Will there also be discount codes available for this period? Hello Dave, you can promote this coupon on your website: (Coupon Expired). Customers get a 10% Discount on Group C1 for rentals in September and October (2 to 22 days rentals – Depending on availability). Is there a code available for October? You can also become fan on facebook to get new offers every month. We replied your post on facebook.